The 2018/19 Fantasy Premier League season is here and we are taking a look at the festive fixture calendar. Champions League, Europa League and EFL Cup games make the congestion in the festive fixture calendar even more significant. 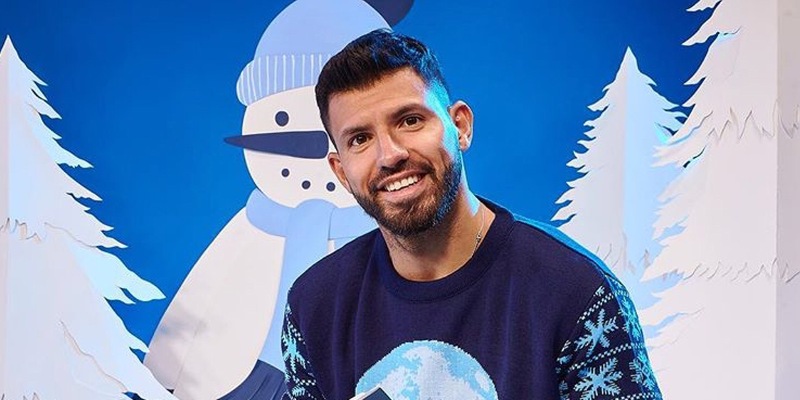 The Christmas period is always the busiest time for Premier League sides, with 9 fixtures in the 40 days from late November to the beginning of January. Add EFL Cup, Champions League and Europa League fixtures into the mix, then some teams have a potential 12 games in under 40 days. Champions League: Matcheweek 5 and 6 of the Champions League will be crucial for Man City, Man Utd, Liverpool and Spurs; as they look to progress to the knockout rounds. Manchester City have qualification almost wrapped up, but Manchester United, Liverpool and Spurs are still in a big scrap as they look to secure qualification and even win their respective groups. Europa League: There’s less of a concern for Arsenal and Chelsea, as they have qualification confirmed to the knockout stages and it looks promising for them to both progress as group winners. The managers will be able to rest key players in their final two group games. EFL Cup: Leicester and Southampton play their rescheduled EFL Cup Round 4 game between Gameweek 13 and Gameweek 14. Six Premier League sides will be in the EFL Cup Quarter-Finals, with many managers opting to field a strong side given the potential of winning silverware comes ever closer. The number of games for Spurs looks ominous. The graphic below shows all the fixtures across all competitions for our Premier League sides in the festive fixture calendar. The chart also displays the number of hours rest time between each fixture: click the graphic to open and zoom for a larger view. We’ve also compiled the number of games for each club and the number of games spanned. Arsenal, Chelsea, Manchester City and Spurs all have 12 games in this period: Spurs are the biggest concern here, as they are struggling to qualify in the Champions League, plus have a tough away fixture against Arsenal in the EFL Cup. Elsewhere, Liverpool and Manchester United have 11 games, with the opportunity to rest assets between Gameweek 17 and Gameweek 18, after failing to progress to the EFL Cup Quarter Finals. Either Leicester or Southampton will have 11 games, with a potential of two EFL Cup games peppering their schedule. The remainder of sides have just the 9 Premier League fixtures to focus on, with the exception of Bournemouth, who join the big sides in the EFL Cup Quarter Final. It could be a golden opportunity for Eddie Howe to finally deliver a trophy at Bournemouth. 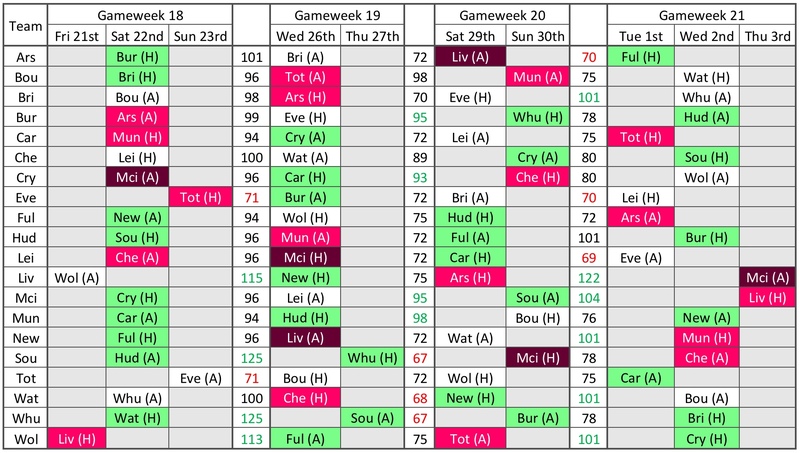 The first congested festive fixture calendar emerges between Gameweek 14 and 16, with the first midweek round of games. 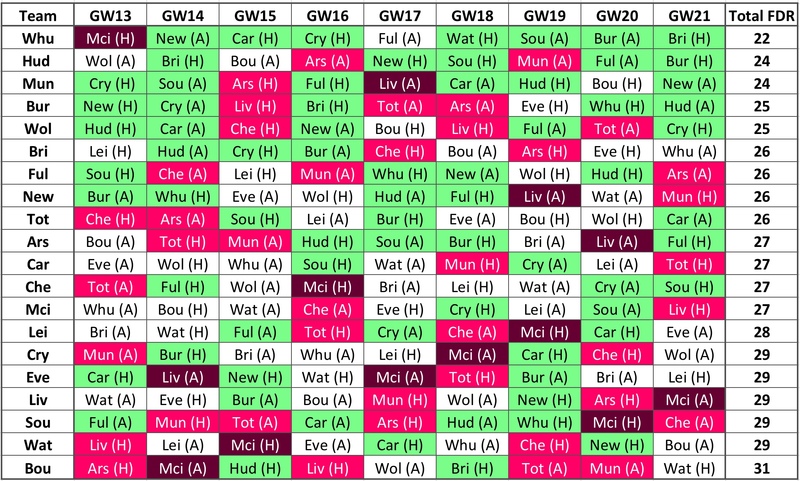 Here’s all of the fixtures and rest times for each club for each phase. Arsenal, Bournemouth and Fulham have two tough fixtures out of the three here. 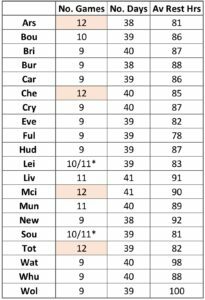 There’s some tight turnarounds, particularly for Arsenal, Bournemouth, Chelsea, Fulham, Liverpool, Manchester United and Southampton: they’ve under 72 hours between Gameweek 15 and Gameweek 16. Two home games in three is beneficial here. 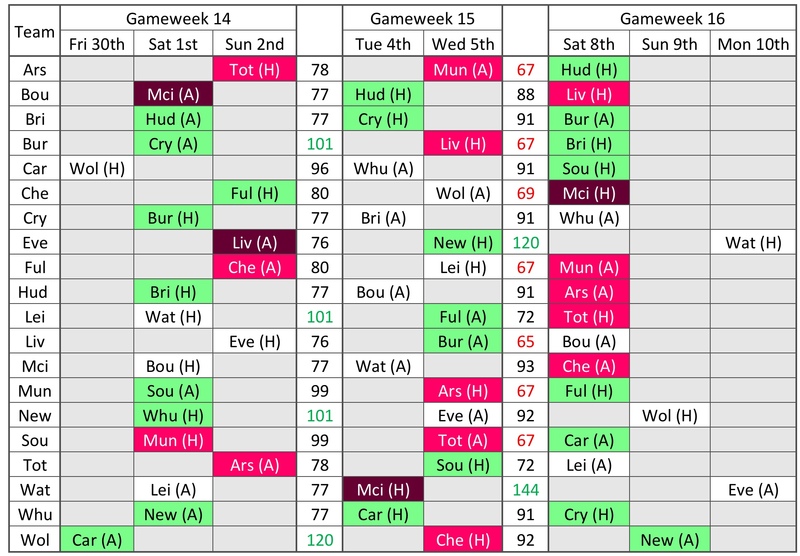 The next phase is between Gameweek 18 and 21, with four games spanning a maximum of 14 days. Liverpool do well for rest time here, followed by Manchester City and Wolves. Everton have the tightest turnaround times, with things not looking much better for Spurs despite an easier schedule. Back to back home games in Gameweek 19 and 20 are particularly favourable, Burnley have good fixtures and a big rest time here, as do Manchester United. It’s a pair of tough fixtures for Bournemouth in that particular pinch point. 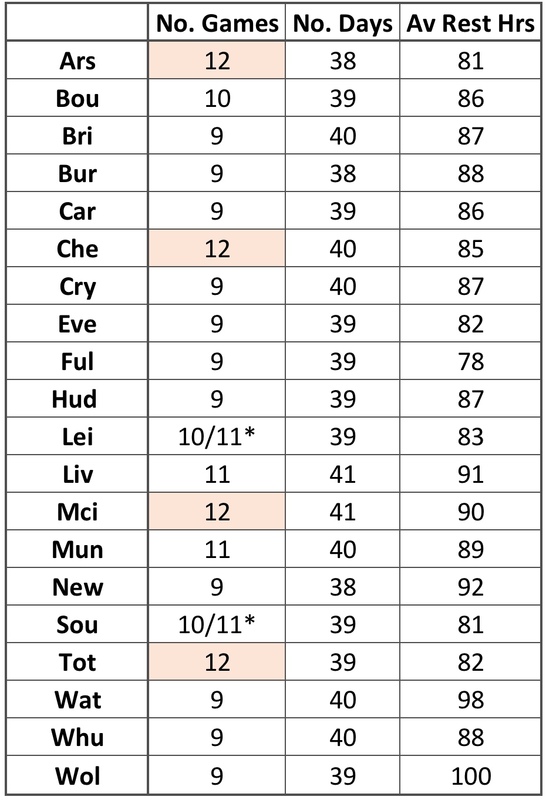 The relative fixture difficulty will be particularly important over the congested festive fixture calendar: here’s the latest FDR ratings from the Official FPL algorithm, correct as of 10/11/2018. We’ve sorted from easiest to hardest. West Ham are the big winners here, with just Manchester City in Gameweek 13 to overcome: it’s easier fixtures from then on, with 5 of the 9 at home too. Huddersfield and Manchester United are the next most favourable, with just two top six sides faced over the festive fixture calendar, Manchester United also have plenty of home games. Elsewhere, Bournemouth are adrift at the bottom with the most challenging schedule: they face five of last seasons top six over the festive schedule, although they do have five home games. Things don’t look much better for Southampton either. The FA Cup returns immediately after this schedule giving clubs their next opportunity to effectively rotate their squads. So how do we cope in the middle? During this time, it’s going to be so important to have a playing bench. If you are on a wildcard, make sure that you have 15 starters in your sides. If you’ve got spare transfers over the next few weeks, look to strengthen your bench. And most importantly, look at patterns of rotation to help with choosing a playing captain each game week! Good Luck!